In the region of North Gujarat, especially in the region of Kutch one of the most interesting ethnic communities is Rabaris. Once a nomadic people, Rabaris follow an interesting lifestyle and customs. Today, most of the Rabaris are settled, though some still continue to be semi-nomadic, raising cattle, camels and goats in the arid deserts of Kutch and western India. Those settled live in small hamlets either in villages or in small towns, sometimes jointly with other ethnic communities and sometimes as a single ethnic unit. Rabaris can be easily identified by looking at their women folk, who are usually clad with long black head scrapes, distinctive heavy brass earrings which hang low, stretching the earlobes. They tattoo magical symbols on their necks, breasts and arms. Their jewellery is modest in comparison to other tribal women. There is an interesting myth about their black wearing. Many years ago Jaiselmer, Rajasthan was the main centre for Rabaris. Once, a Muslim King fell in love with a young Rabari girl. However, his proposal was refused by the community. The king got angry and threatened to kill all of them. The Rabaris out of fear broke their camp in the middle of the night with the help of a Muslim man. But the Muslim man while assisting the Rabaris for their escape was killed by the king. So it is told that Rabari women wore black from then to mourn his death. It is also said that the loyalty of this man gives insight to the ease of interaction between the Hindu Rabaris and Muslims found in Kutch. Some historians associate the Muslim King with Ala-ud-din Khilji. During his rule, it is believed that migration of Rabaris took place to Kutch. Some also identify Rabaris with Huns who came to India in the middle of 1st millennium AD. 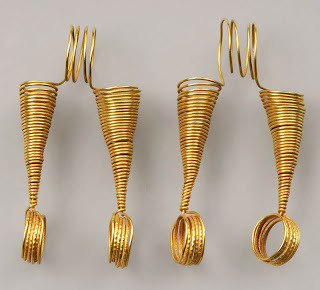 Another interesting aspect of Raabari women is their earrings which is the most abstract form of snake earrings. Women in Puskar, Rajasthan describe a mushroom as snake umbrella, because it comes out after the rains and snakes have the habit of hiding under its hood. The nagali earring is supposed to stand for the double shape of the mushroom. Rabari tribes, now living in Kutch passed the Puskar region on their migration from the north of Rajasthan and may have seen the local earrings there, or rather transferred their main designs to the village people. The nagali earrings of the Kutchi Rabari with their spiral, spring like shape can be considered as the form most closely related to snake. In contrast to woman, a Rabari man commonly appears in white dress, golden earrings and a big stick in the hand. They wear dhoti and on the top a short double breasted waist coat (all white) laced over the chest and tied, long sleeves which are gathered up and folded at the arms. About their origin there are interesting myths. According to one of the legends on their origin, Lord Shiva gave Sambal, one of these minions, three apsaras, to marry and flourish with a condition that he will not speak one word to them. If the violated the condition, the apsaras would be lost forever. From his association, one son and four daughters were born. Soon, the family grew large and therefore the lord asked him to go and dwell on the earth. Since then Sambal was called Rabari. According to another version, Sambal was an ace camel breeder. Someone started stealing the beautiful and sturdy animals. Sambal soon discovered that the stealer was a goddess. However, Sambal caught her and through a clever stratagem removed her clothes, leaving her in an embarrassing situation. As per the tradition in situations like this, the two married and after wandering across Haryana, Rajasthan and Sind, settled in Kutch. Rabaris are devout Hindus. According to their myth of existence they were created by Parvati, the consort of Lord Shiva, who wiped the dust and sweat from Shiva as he was meditating and fashioned the very first camel from the dust balls she collected from his body. Once Shiva had breathed life into this camel, it kept running away, so Parvati fashioned a man, and the first Rabari was given life so he could mind the camel. Keeping animals has thus always been a pious occupation and Rabaris see themselves primarily as custodians of animals during their moral existence, rather than their owners. It is also their beliefs that the mother goddess presides over them. Her advice is taken about when to start out migration, and animals are commended to her care. Embroidery is a vital, living and evolving expression of the crafted textile tradition of the Rabaris. Rabari women diligently do embroidery on textiles as an expression of creativity, aesthetics and identity as far as the tribe’s collective memory goes. Afternoons are time for embroidery in all Rabari villages when women routinely embroider trousseaus, everyday apparel, dowry bags, bride's ghagro (skirt), kanchali (blouse) and ludi (veil), the groom's kediyan or shirt, children's cradle cloths as well as dowry bags and auspicious torans. Rabari embroidery is very vigorous, with bold shapes. Designs are taken from mythology and from their desert surroundings. They use glass mirrors in various shapes: round, lozenge, rectangular, square, triangular, and beak shaped. The stitches are square chain interlaced with buttonhole for mirror work, single chain, knot, Romanian, blanket interlaced with herringbone, running, and double running. Mosuna is a village solely inhabited by Rabari community in Kutch. The village is picturesque surrounded by hills and throne forest and isolated. It is located at a distance of 15 kms from Nakhatrana. I visited Mosuna in a quiet evening recently and had a lively interaction with the Rabaris living there. The village looks charming with temples, houses and Rabari women with their traditional dresses and jewellery.